Lots of great shapes and great looks! This is our most impressive range of shapes and sizes. The Blick Studio Bristle is a truly beautiful, yet affordable brush. Unbleached natural bristle from China sets strikingly on rich lacquered handles, individually sized to balance each size head. 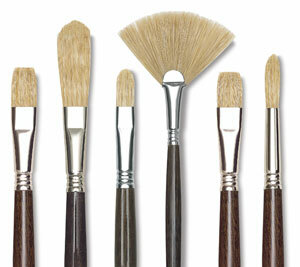 A mid-level of firmness makes these the most spontaneous and expressive of our bristles. Blick Studio Bristle Egbert — Egberts are essentially elongated filberts, and are brushes that have become truly rare. They hold more color, and allow for stylized strokes in expert hands. 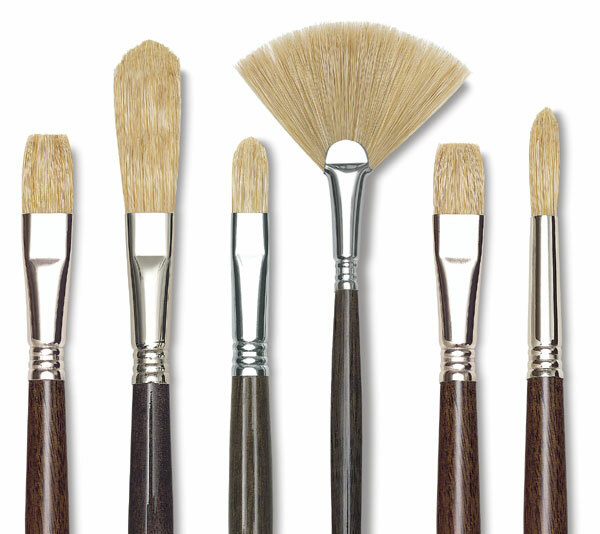 Round, Set of 5 Brushes — This set includes sizes 0, 2, 6, 10, and 14. Flat, Set of 5 Brushes — This set includes sizes 0, 2, 6, 10, and 18.